Description: In Christian Origins and Hellenistic Judaism, Stanley E. Porter and Andrew W. Pitts assemble an international team of scholars whose work has focused on reconstructing the social matrix for earliest Christianity through reference to Hellenistic Judaism and its literary forms. Each essay moves forward the current understanding of how primitive Christianity situated itself in relation to evolving Greco-Roman Jewish culture. Some essays focus on configuring the social context for the origins of the Jesus movement and beyond, while others assess the literary relation between early Christian and Hellenistic Jewish texts. 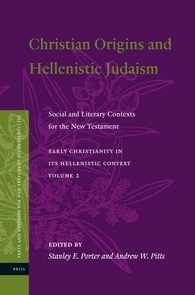 Citation: Gerbern S. Oegema, review of Stanley E. Porter and Andrew W. Pitts, eds., Christian Origins and Hellenistic Judaism: Social and Literary Contexts for the New Testament, Review of Biblical Literature [http://www.bookreviews.org] (2014).